What’s Cooking with the Felician Sisters? 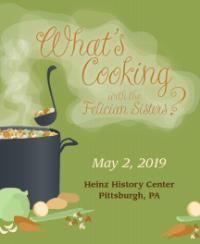 Join us at the Heinz History Center for a virtual journey across the continent to experience how the Felician Sisters are reaching out to those in physical and spiritual hunger as they provide Food for the Body – Food for the Soul. Meet the Sisters who are striving to be caring and compassionate servants to those in need, and learn about the places and people they serve, from the snowy landscape of Canada’s Northwest Territories to the arid desert of America’s Southwest. Tickets are $125 per person. VIP tickets are $150 per person and include parking in the 13th and Smallman parking lot adjacent to the Heinz History Center, admission to the event, and your choice of a pre-event private tour of one of the following exhibits: Western Pennsylvania Sports Museum, The Vietnam War: 1945-1975, or the Special Collections Gallery. Private tours start promptly at 5:00 pm. Proceeds benefit the Felician Sisters of North America and their ministries.